1 2 3 4 "Après 29 ans de pouvoir, le Président Kérékou tire sa révérence", IRIN, 6 April 2006 (French). 1 2 3 4 5 "Benin". Profiles of People in Power: The World's Government Leaders. Europa Publications. 2003. pp. 55–56. 1 2 3 4 5 'Kunle Amuwo, "The State and the Politics of Democratic Consolidation in Benin, 1990–1999", in Political Liberalization and Democratization in Africa (2003), ed. Ihonvbere and Mbaku. ISBN 978-0275975067. 1 2 3 4 5 6 7 8 Samuel Decalo, "Benin: First of the New Democracies", in Political Reform in Francophone Africa (1997), ed. Clark and Gardinier. ISBN 978-0813327860. ↑ Le Vine, Victor T. (2004). Politics in Francophone Africa. Boulder, Colorado: Lynne Rienner Publishers. p. 145. 1 2 3 4 Abiodun Onadipe, "The return of Africa's old guard – former African leaders, mostly dictators, bid for a return to power", Contemporary Review, August 1996. 1 2 3 4 Allen, Chris. "'Goodbye to All That': The Short and Sad Story of Socialism in Benin". In Hughes, Arnold. Marxism's Retreat from Africa. 1 2 3 4 5 Claffey, Patrick (2007). 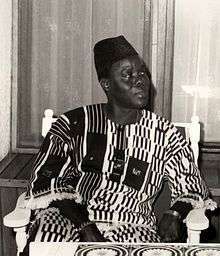 "Kérékou the Chameleon, Master of Myth". In Strauss, Julia C.; O'Brien, Donal Cruise. Staging Politics: Power and Performance in Asia and Africa. pp. 98–101. ↑ Adesina, Olutayo (2005). "Benin, Republic of (Dahomey) Kérékou, Mathieu (1935–)". In Shillington, Kevin. Encyclopedia of African History. pp. 242+. 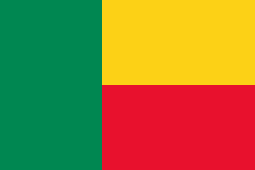 ↑ "Benin profile – Timeline". BBC News. 4 June 2015. Retrieved 14 October 2015. 1 2 3 4 Elections in Benin, African Elections Database. ↑ Richmond, Yale; Gestrin, Phyllis (1998). Into Africa: Intercultural Insights. p. 36. 1 2 "BENIN: President Mathieu Kerekou leaves after 29 years". IRIN. 7 April 2006. Retrieved 14 October 2015. ↑ Cyr, Ruth Nora (2001). Twentieth Century Africa. San Jose, California: Writers Club Press. p. 35. 1 2 Okanla, Karim (20 August 2003). "Benin's 'magical' leader". BBC News. ↑ Decalo, Samuel (June 1985). "African Personal Dictatorships". The Journal of Modern African Studies. 23 (2): 209–237. doi:10.1017/S0022278X0000015X. 1 2 "The 'Chameleon's triumphal return". African Business. 1 April 2002. Archived from the original on 19 January 2012. Retrieved 15 October 2015 – via Internet Archive Wayback Machine. ↑ "Kerekou – L'experience au service de la jeunesse". Library of Congress Africa Pamphlet Collection – Flickr. Retrieved 11 May 2014. 1 2 Tirthankar Chanda, "Les «Caméléons» meurent aussi: Mathieu Kérékou s’en est allé", Radio France Internationale, 14 October 2015 (French).